Sixth grader Chloe Fuller leads the Neshobe Flower Girls as they decorate the monument in Brandon Memorial Day. 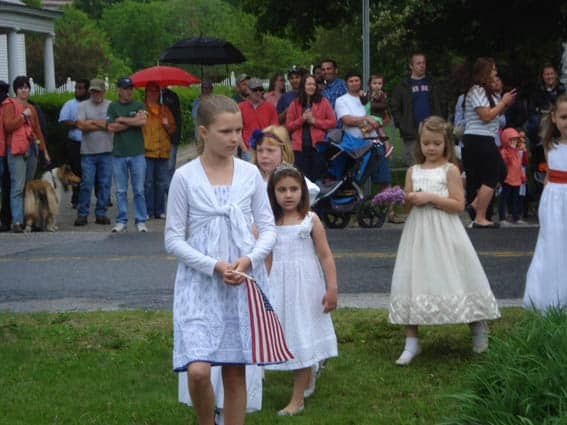 BRANDON – All across the area, Vermont towns observed Memorial Day with speeches, parades, prayers, and, in Brandon, the Neshobe School Flower Girls, who decorated a monument in the center of town. It is a long-standing tradition. After the parade, a group of girls from the first grade, all dressed in white, are led from the town green to the monument at an intersection in the center of town. They circle the monument and leave lilacs to remember the fallen. Flowers provided the theme for much of Brandon’s observance. Jean Lamarr of the Legion Auxiliary served as emcee. She said the red poppy symbolized the blood shed in the America’s wars. The idea of the red poppy as a symbol of battlefield sacrifice goes back to Napoleon, because the poppy is one of the few plants that can thrive in the desolation of a ravaged battlefield. Its seeds are airborne, and they can lie in the ground for a long time before germinating. The significance of their abundance and bright red coloring where soldiers had fallen was lost on few. Struck by the sentiment, Michael determined to always wear a red poppy of remembrance from that moment on. As she had already spent much of her own money on flowers to provide a more cheerful atmosphere to the office, some soldiers gave her money to cover the expense. She bought 25 red poppies. After that, she began a personal crusade to get the poppy adopted as a national memorial symbol. The American Legion adopted the poppy as the U.S. national emblem of remembrance in 1920. From there, other nations across the world also adopted the memorial poppy. Several veterans of America’s wars attended the Brandon ceremonies Monday, including Brandon resident Harold Adams. Adams served in Germany as part of the 28th Division of the 110th Infantry in 1944 and 1945, as World War II was winding down. He recalled that German children seemed afraid of the American soldiers. “I looked across the street and saw a little girl, about four years old,” he said. “She had blond hair and blue eyes, and I asked her name, which was Maria Han. She was terrified of me. She wouldn’t come over. “I held out a candy bar and said, ‘Ich haben ein bonbon.’ But she didn’t dare come to my side of the street, so I left the candy bar, and she came across the street and grabbed it. She was back there the next day, same place and time, but she ran across the street. I never saw anyone as terrified in my life. “’Why is everyone so afraid of us?’ I asked.